The atomic clock comes in many varieties. Some are chip-sized electronics, developed for the military but available commercially now , while bigger and more accurate atomic clocks keep track of time on GPS satellites. But all atomic clocks work on the same principle. Pure atoms—some clocks use cesium, others use elements like rubidium—have a certain number of valence electrons, or electrons in the outer shell of each atom. When the atoms are hit with a specific frequency of electromagnetic radiation (waves of light or microwaves, for example), the valence electrons transition between two energy states. In the 1960s, scientists turned away from measuring time based on the orbits and rotations of celestial bodies and began using these clocks based on the principles of quantum mechanics. It may seem like a strange way to measure time, but the duration of a specific number of oscillations, or “ticks,” in a wave of electromagnetic radiation is the official method by which scientists define the second. Specifically, a second is the duration of 9,192,631,770 oscillations of a microwave laser that will cause cesium atoms to transition. But we have even better atomic clocks than the ones that measure cesium. “If our two ytterbium clocks had been started at the beginning of the universe, at this point in time they would disagree with each other by less than one second,” says William McGrew, a physicist at the National Institute of Standards and Technology (NIST), in an email. 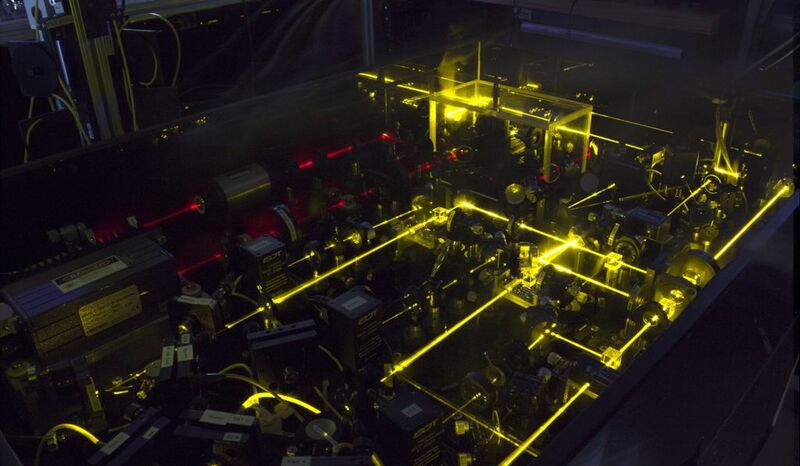 The ytterbium clocks at NIST, Yb-1 and Yb-2, are a unique type of atomic clock known as an optical lattice clock. Essentially, the clocks use electromagnetic radiation in the optical frequency, or lasers, to trap thousands of ytterbium atoms and then cause their outer electrons to transition between a ground energy state and an excited energy state. Compared to cesium, a higher frequency of electromagnetic radiation is required to cause ytterbium to transition. All electromagnetic waves, from radio waves to gamma rays, and all the visible light in between, are the same type of waves made up of photons—the difference is simply that waves with higher frequencies oscillate more rapidly. Microwaves, which are used to transition cesium, are stretched into longer wavelengths and lower frequencies than visible light. Using atoms that transition at higher frequencies is key to building a better clock. While a second is currently about 9 billion oscillations of a microwave, the same duration of time would be represented by closer to 500 trillion oscillations of a wave of visible light, enhancing scientists’ ability to precisely measure time. If the measurement laser on an ytterbium clock is dialed in to exactly the right frequency, the ytterbium atoms will jump up to the excited energy state. This occurs when the laser is at a frequency of exactly 518,295,836,590,863.6 Hertz—the number of “ticks” in one second. “This corresponds to a wavelength of 578 nanometers, which appears yellow to the eye,” McGrew says. New measurements with Yb-1 and Yb-2, led by McGrew’s team at NIST, have achieved new records in three key areas of measurement precision, producing, in some respects, the best measurements of the second ever achieved. Specifically, the clocks set new records for systematic uncertainty, stability and reproducibility. The new measurements are detailed in a paper published today in Nature . The ytterbium optical clocks are even more precise in these aspects than the cesium fountain clocks that are used to determine the definition of a second. The ytterbium clocks are technically not more accurate than the cesium clocks, as accuracy is specifically how close a measurement is to the official definition, and nothing can be more accurate than the cesium clocks that the definition is based on. Even so, the key metric here is systematic uncertainty—a measure of how closely the clock realizes the true, unperturbed, natural oscillation of the ytterbium atoms (the exact frequency that causes them to transition). The new measurements match the natural frequency within an error of 1.4 parts in 10 18 , or about one billionth of a billionth. The cesium clocks have only achieved a systematic uncertainty of about one part in 10 16 . So compared to the cesium clocks, the new ytterbium measurements “would be 100 times better,” says Andrew Ludlow, a NIST physicist and co-author of the paper. The challenge with these types of measurements is dealing with external factors that can affect the natural frequency of the ytterbium atoms—and because these are some of the most sensitive measurements ever achieved, every physical effect of the universe is a factor. “Almost anything that we could arbitrarily think of right now eventually has some effect on the oscillation frequency of the atom,” Ludlow says. To reduce the effects of these natural physical factors, the ytterbium atoms, which occur naturally in some minerals, are first heated to a gaseous state. Then laser cooling is used to reduce the temperature of the atoms from hundreds of degrees kelvin to a few thousandths of a degree, and then further cooled to temperatures of about 10 microkelvin, or 10 millionths of a degree above absolute zero. The atoms are then loaded into a vacuum chamber and thermal shielding environment. The measurement laser is beamed through the atoms and reflected back on itself, creating the “lattice” that traps the atoms in high energy parts of a standing wave of light, rather than a running wave, such as a typical laser pointer. Improving the “stability” and “reproducibility” of the measurements, which the ytterbium clocks also set new records for, helps to further account for any outside forces affecting the clocks. The stability of the clocks is essentially a measure of how much the frequency changes over time, which has been measured for Yb-1 and Yb-2 at 3.2 parts in 10 19 over the course of a day. Reproducibility is a measure of how close the two clocks match one another, and through 10 comparisons the frequency difference between Yb-1 and Yb-2 has been determined to be less than a billionth of a billionth. Such precision in measuring time is already used by scientists, but the practical applications of improved measurements of the second include advances in navigation and communications. Though no one could have known it at the time, the early work with atomic clocks in the mid-20th century would ultimately enable the Global Positioning System and every industry and technology that relies on it. 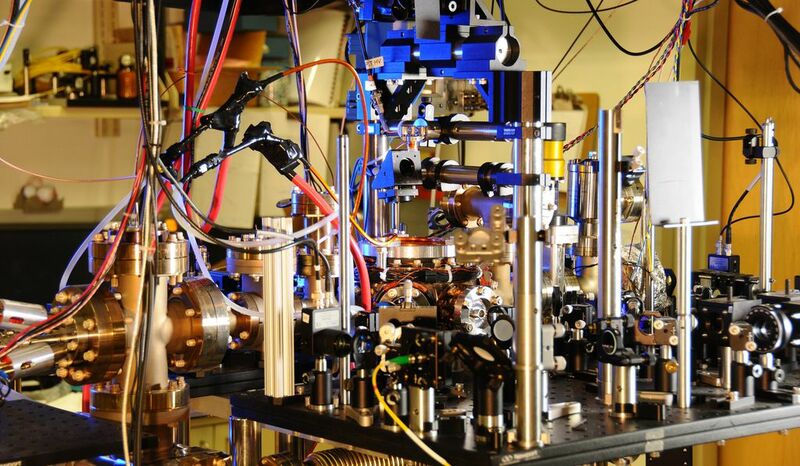 “I don’t think I could predict completely what applications in 20 or 50 years will benefit the most from this, but I can say that as I look back in history, some of the most profound impacts of atomic clocks today were not anticipated,” Ludlow says. The ytterbium clocks could also be used in advanced physics research, such as gravitational field modeling and the possible detection of dark matter or gravitational waves. Essentially, the clocks are so sensitive that any interference due to changing gravity or other physical forces could be detected. If you positioned multiple ytterbium clocks around the world, you could measure the minute changes in gravity (which is stronger closer to sea level as well as closer to the poles), allowing scientists to measure the shape of Earth’s gravitational field with more precision than ever before. Similarly, an interaction with dark matter particles, or even possibly gravitational waves affecting two clocks spread far apart, could be detected. In the next 10 years or so, it is possible that the measurement science institutions of the world will decide to redefine the second based on an optical clock rather than a cesium clock. Such a redefinition is likely inevitable, because optical lasers operate at much higher frequencies than microwaves, increasing the number of “ticks” of the clock contained in a second. An ytterbium clock measurement would be a good candidate for a new definition, but optical lattice clocks using mercury and strontium have also produced promising results, and ion optical clocks, which suspend and transition a single atom, present another intriguing possibility for a new definition. These measurements of atomic phenomena are getting more and more precise, and where our evolving understanding of time will take us, it is impossible to know.